SAN MATEO, Calif., BARCELONA and ZARAGOZA, Spain—March 2, 2015—At Mobile World Congress today, Libelium and Microsoft (MSFT) announced that Microsoft Azure Cloud integrates with Waspmote wireless sensors, to speed time-to-market for Smart Cities and Internet of Things (IoT) projects with scalable Cloud infrastructure. McKinsey Global Institute forecasts the economic potential of the IoT to value from $2.7 trillion to $6.2 trillion annually by 2025. 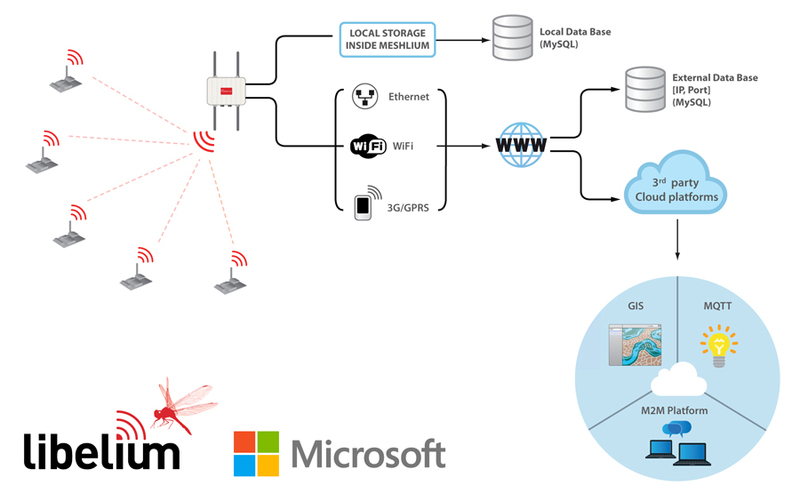 Sensor networks based on Waspmote sensor nodes and Meshlium Internet gateways power projects in the industrial IoT, smart agriculture, energy monitoring, and for environmental and industrial control. Businesses use Microsoft Azure to build and manage applications and services through a global network of datacenters. For Libelium customers, Microsoft Azure provides a scalable infrastructure for data, virtual machines, server and frontend applications. With sensor technology to measure energy use, monitor environmental conditions, water quality, businesses can reduce costs and increase productivity. A customer integration of Libelium and Microsoft Azure demonstrates a complete industrial IoT solution in a Smart Factory, from sensor integration on the factory floor to business processes and data visualization in real time. How it works: Smart Factory Case Study: Reducing Maintenance Costs and Ensuring Quality in the Manufacturing Process. Read more about Connecting Sensors to the Cloud. For more Technical information go to Waspmote, Plug & Sense! and Meshlium Gateways website. For more information about our Cloud solutions and partnerships contact the Libelium Commercial Department.